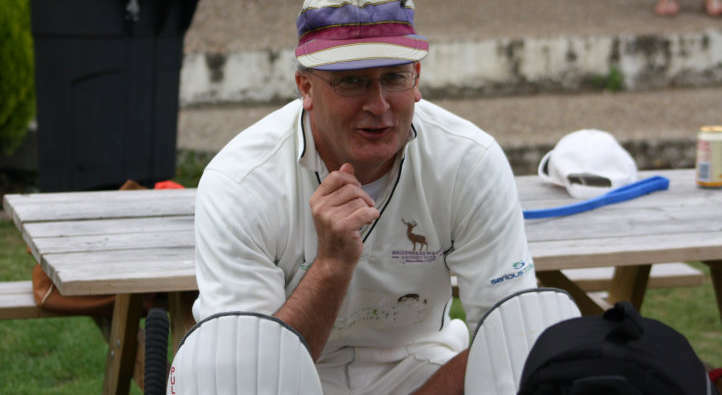 Skipper Armstrong was blissfully unaware of the forecast for Monday morning as he downed the beers and gorged himself on the left over hot dogs from Brett's 40th birthday bash, still digesting the hard fought 4 run victory earlier in the day. A sleepless night and the deafening sound of a torrential rain storm had Armstrong wondering about the state of the wicket. A text to Charlie @ 3.50 am saying covers not put on may have to work on wicket later than normal, was responded to @ 8.50 saying wicket ends too wet, got 20/20 @ Henley, perhaps Ashley can roll wicket later if he's playing! So a call around 9.30 to Ash saying pick up @ 11.15ish was greeted by a half asleep Aussie saying fine. Little did Armstrong realise that he had been to Smokey's and only got in at around 4 ish ! Still 40 minutes rolling and copious amounts of sawdust on the wicket ends meant the pitch was playable albeit the batsmen crease was like a quagmire! The all important toss went ahead with Armstrong losing and predictably being asked to bat, even though hit was a friendly. A further rain shower meant the game was reduced to a 38 over affair. Openers Blair King & Vijay Kalabandi opened up with King being bizarrely dismissed off the first ball of the second over. He seemed to walk down the wicket and aimed to flick the ball through midwicket only to get a leading edge, meaning the ball ended up at point. King though slipped and continued down the wicket and was run out as Vijay rightly sent him back, leaving him yards out. Later King said I didn't know where the ball had got but kept on going down the wicket ! Kalabandi played the conditions by trying to advance and get the ball on the full. He advanced and drove the ball through the covers, this put the bowler of his length resulting in a few full tosses, which were gleefully dispatched. Jatin was literally bogged down by conditions and hit a loose ball straight to square leg to leave M & B at 20 for 2 in the 8th over. Having just about woken up, Ash Becker appeared through the gloom at no 4 fresh off his 35 for the 1's on the Saturday. The pair managed to add a further 26 before Kalabandi was bowled for 33 in the 14 over. Although never at home on the wicket Becker was certainly more fluent and began to stroke the ball around for singles and hit the odd bad ball to the boundary. Atif Amin came in at 5 and was surprisingly off the mark first ball for 2 but he reverted to type and was scoreless for the next 21 balls before cutting a ball to point, to leave M & B in the quagmire at 65 for 4 in the 23rd over, with only 15 overs left. At this stage skipper Armstrong was happy to bat out the overs and possibly get around 120 -125. M & B were lucky to have Brian Dixon coming in a 6 and being in prime form he was able to make the wicket look easier than it was. Having already hit a couple of boundaries his innings was give a kick start by bad first over from Rohan Ghosh, which Dixon dispatched for 2 6's and a 4 to bring up the M & B 100 in the 27th over. Dixon's fluency made it easier for Becker who began to creep closer to his career best score of 42, Becker benefited from a surprising drop form Tim Kelleher at mid wicket and a more difficult chance when he eventually reached 42! No matter what Becker advanced to his maiden club 50. Dixon was eventually bowled for a game changing 48 in the 24 th over, which contained 5 4's and 2 6's, having added 77 in 12 overs with Becker for the 5th wicket. Becker saw M & B through to 181 for 6 at the end aided by Tom Evans and Tom Allen, as he hit a number of boundaries, albeit being dropped again, to finish with 69 not out, which included 4 4's and a 6. As the players departed the rain returned and the covers were put on. The prolonged spell of rain eventually signalled the end of the game, with the rest of the wicket ends simply not playable. As is the tradition with Kensington Ash Becker was presented with the man of the match prize.